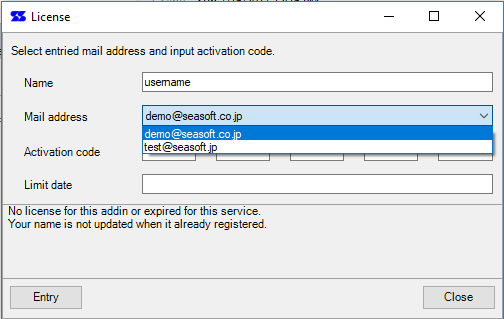 When the license application procedure is completed, an activation code will be delivered to the registered e-mail address. 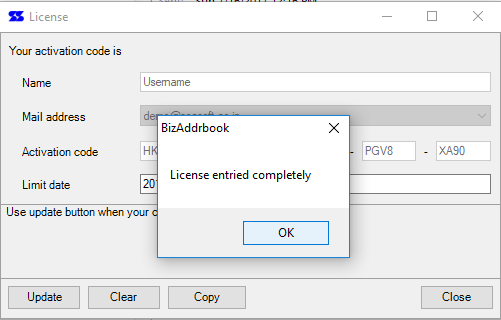 You can register the license with the "License" button on the "Biz Addrbook" tab of "Home" menu. License is issued for each e-mail address, but even if you use multiple accounts with e-mail software, you can use one license. After obtaining the activation code, please enter the activation code from "License" menu button. Enter your name, select your email address in the combo box, enter the activation code, and press the "Register" button. After communicating with the server, the license will be valid. 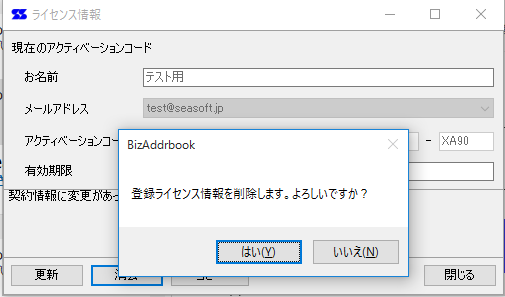 For example, if you acquire a new regular license while using a trial license, you need to erase the current license and enter new license information. 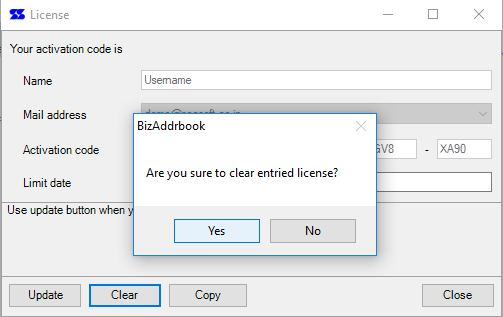 You can clear the license information on the local computer with "Clear" button of license information. 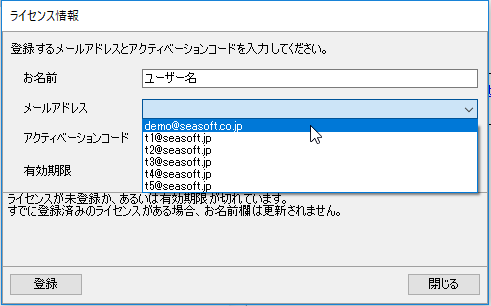 * Clearing a license is a function to erase registered contents on local computer, and the contract license on the server is not deleted. "License update" processing is necessary, for example, if you extend the license contract or change the Master settings. Display "License information" and click "Update" button to communicate with the server and update license information. 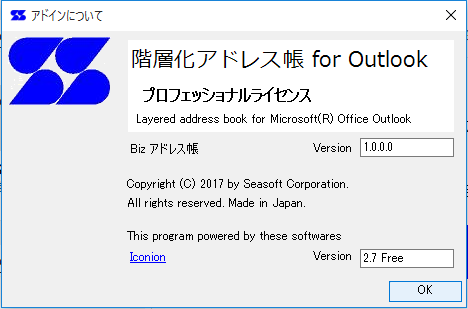 If you do not need license update (in the latest state), a message will be displayed stating that updating is not necessary. 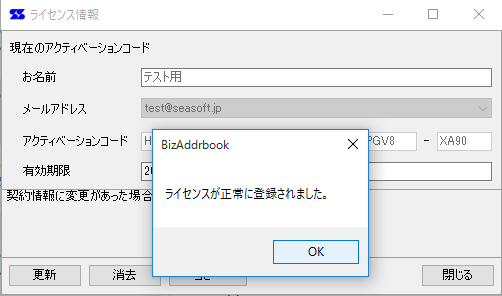 "About" button on "Biz Addrbook" Ribbon tab, software version information and license type are displayed. 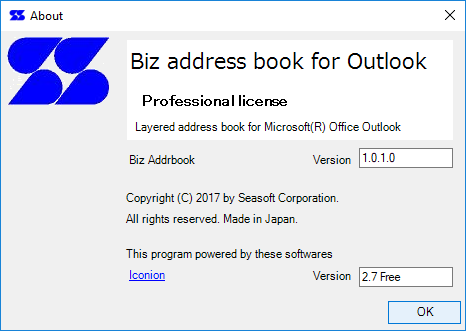 If the license is invalid or the deadline has expired, a message will be displayed immediately after starting Outlook.